The Vega (Weaver) Festival is based on an old Shinto tradition in Japan where a selected girl weaves cloth for God near the river and the legend in China that Vega and Altair can meet between the Milky Way once a year. The Japanese Vega Festival, called “Tanabata”, has changed since the original tradition was imported from China in the Nara Period (710-784). During the Heian Period (794 -1185), it was treated as an imperial festival, but then as time went by, it became a citizen’s festival where people dedicated fruits and vegetables, wishing to improve their hobbies. Also read: “Pictures and Video from Kyoto Vega Festival 2014“. Now people in Japan write a wish on a special paper called Tanzaku and hang it on arrow bamboos, hoping that their wish will come true, just like the wish of Vega and Altair could be achieved on this special day (July 7th). In Kyoto, Tanataba is conducted in August, which is July in the Old Calender, since the current July is busy with the Gion Festival. There will be two main venues for this annual event; Kamogawa River and Horikawa Street. Kyoto’s “Tanabata” event will start on August 2nd and end on August 11th. In the Kamogawa Area, the wind-bell lanterns, the Tanzaku paper decorations, the projection mapping (19:30 – 21:30 August 4th – 11th), the Yuzen floating (long fabrics dyed with Kyoto “Yuzen” technique will be floated in the river: 18:00, 19:45 August 3rd and 4th only), the special food/product stands and so on can be seen. 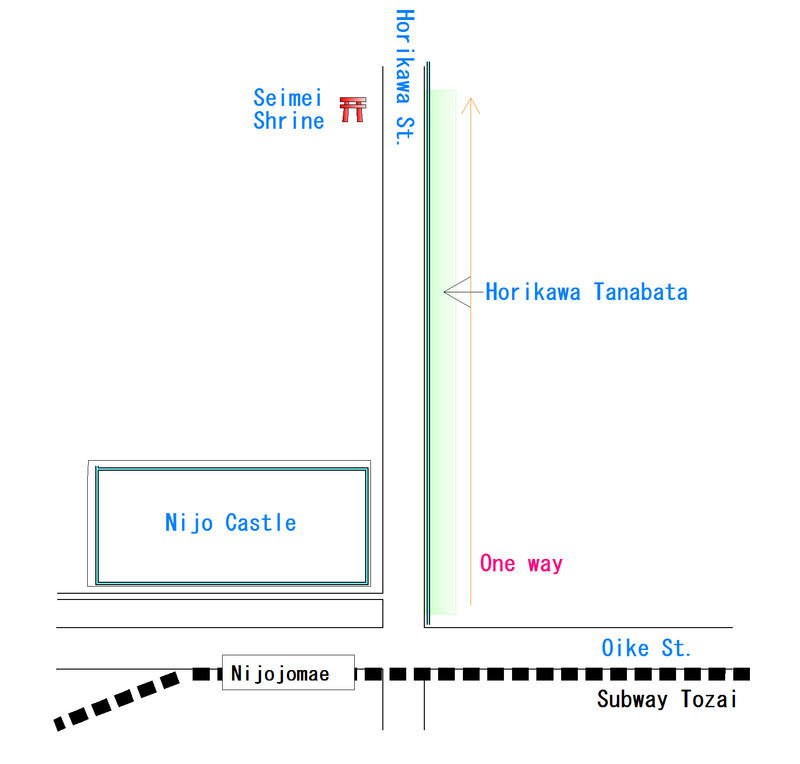 In Horikawa Area, the projection mapping at Nijo Castle (19:30 – 21:00 August 2nd – 11th), the LED Milky Way, bamboo LED artwork and so on can be enjoyed. 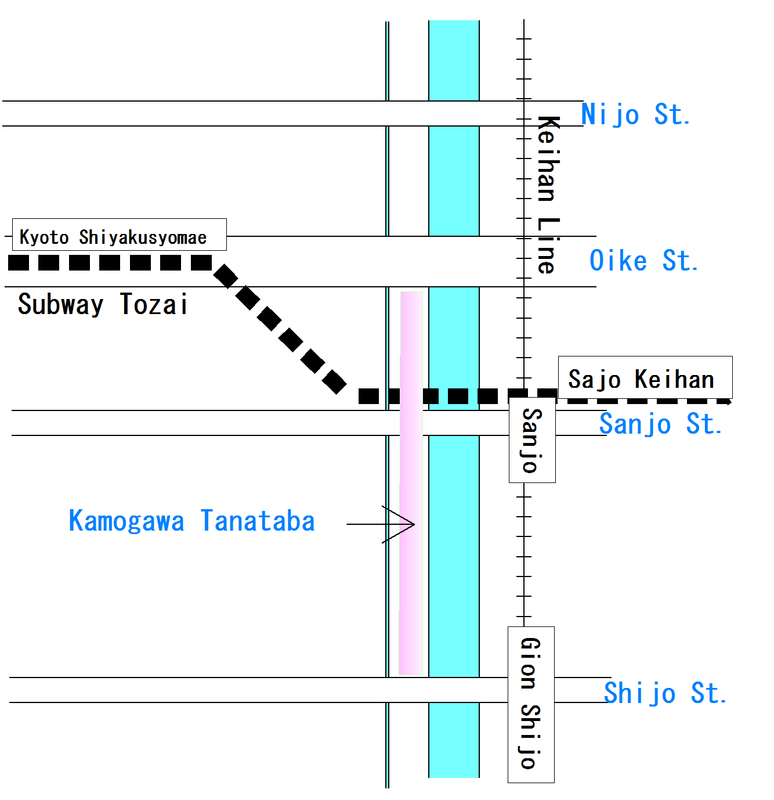 As the following maps show, both locations are easy to access by the Subway Tozai and the Keihan Line.